Those who do not win any races with the STEVENS Super Prestige need to train more, Bikerumor.com writes and awards an “honorable mention“ to the high-end cross bike. Throughout the year the editors of Bikerumor.com ride the newest and – often – the best bikes presented by the bicycle industry. At the end of each year each editor presents the best bike their personal perspective from every category – each awarded with an “honorable mention“. The STEVENS Super Prestige was handed such an award by Cory Benson of Bikerumor. The editor after many rides and races says that this bike was an outright race weapon. Not only because it’s the weapon of choice of Cyclocross World Champions Wout van Aert and Sanne Cant. 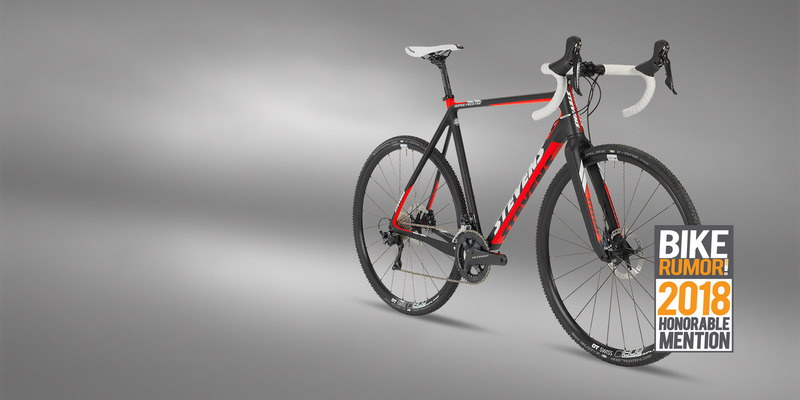 The current edition, revamped one year ago, was even lighter – frame weight 1,000 grams in size 58cm – and offered more compliance especially at the saddle and therefore more comfort. At the same time the Super Prestige – be it as a frameset or complete bike in three versions – was also more reasonably priced than many other models of this kind. Conclusion: Those who do not win any races with the STEVENS Super Prestige need to train more. The Super Prestige willingly follows every order to accelerate – the whole way to the top and into the rainbow jersey.